← (#87) Priority Management: Are You Doing the Right Things or Are You Just Doing Stuff? does not necessarily equate to an explosion of credible knowledge. Information literacy concerns itself with locating, evaluating, and using information in an effective and efficient manner. “Information” can come in text, video, photos, recorded interviews, or music. Up until a few short years ago, the ground zero for finding information was your local library. Whether you were looking for a newly-released book, doing research for history class, searching for a video, or wanting to scan the local newspaper, the library represented THE place to satisfy your research needs. You might even have found a small coffee shop nearby. Kind of a one-stop-intellectual opportunity. What we have to remember is that the explosion of information does not necessarily equate to an explosion of credible knowledge. There are four components of information literacy—and due to the availability of SO MUCH information, it is even more imperative to understand and adhere to these four steps of becoming information literate. Understand what information we need. Know where to find the information we need. Evaluate the information we find (is it “good” or “bad”?). Organize and use the information in a logical and appropriate manner. Bonus Section: What is Your Digital Tattoo—and How is it Connected to Information Literacy? I have written on this blog before about the Power of Social Media. Social media has become THE game changer in how we communicate. It is not a fad. It is not going away. It is not static—it continues to change daily. And it IS part of the new information literacy. What we have to do is learn how to use it effectively—and with integrity and dignity. I used to talk about “digital footprints” as a metaphor for the impressions we leave when we post anything online. I have come to learn that a “footprint” is not an adequate mental representation. Instead, think “digital tattoo.” This more adequately represents what we develop online—a lasting image. Consider that when you post anything online you are creating your online persona—your digital reputation. It consists of your words (email, texts, tweets, status updates) and your images (photos and videos). It has the potential of being found by anyone. The following video is of a conversation I had with a musician friend who uses social media for his music. Pay attention to your grammar, spelling, and sentence structure. Pay attention to the messages you convey with your words (classy, sassy, goofy, professional). Be appropriate with images you post. Think of your mentor and your mother! Would you want them to read what you have just put out there for the world to see? The bottom line is to maintain a sense of civility and propriety. Just because you have communicated does not mean you have connected. Be respectful. Remember, social media is a resource to use. Use it well. Information literacy is a skill. Develop it purposefully. 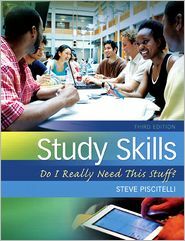 For more on information literacy and social media, see my book Study Skills: Do I Really Need This Stuff? 3rd edition (Pearson Education). Please visit my website (www.stevepiscitelli.com), contact me at steve@stevepiscitelli.com, or visit Pearson Education, Amazon and Barnes and Noble. This entry was posted in information literacy, Social Media. Bookmark the permalink. Mention of Civility is SO important. Glad you included it as a study/life skill. Thanks, Mimi! It is simple…but often neglected, isn’t it. Thanks for reading.